Edinburgh, Scotland: Gray & Adams has won praise from Waitrose for the part it has played in developing the retailer’s ground-breaking ‘ultra-low carbon’ trailers. He was speaking shortly after Waitrose confirmed more orders for its aerodynamic boat-tail trailers from Gray & Adams. The John Lewis Partnership is a member of the Centre for Sustainable Road Freight consortium, a collaboration between Cambridge and Heriot-Watt Universities and organisations in the freight and logistics sectors. It researches engineering and organisational solutions that seek to make road freight economically, socially and environmentally sustainable. Waitrose has long specified its Gray & Adams trailers with wind-cheating features such as large radius panel cappings and side skirts. However, through John Lewis’s participation in the government’s low-carbon truck trial programme, and with input from Cambridge University, the retailer has developed a trailer that takes environmental compatibility to another level. The academics conducted wind tunnel research and focused particularly on the aerodynamics beneath and around the rear of the trailer, as well as between the trailer and the tractor unit. They then came up with a series of proposed modifications designed to cut aerodynamic drag by 14%. These, they predicted, would deliver fuel savings of approximately 7%. Enter Gray & Adams. Simon Gray explained: “It’s all very well having a nice set of drawings, but you then have to make it work in the real world. Gray & Adams did a good job of that. “We sat down with the manufacturer and worked our way through it. I recall one problem relating to reversing the trailer onto the bay. It meant we had to amend the original aerodynamic design in order to accommodate the loading dock infrastructure, but we were able to do so without compromising the optimum boat-tail angle. Rather than lowering the door height, the boat-tail taper was achieved by reducing insulation at the rear of the trailer, where ambient products tend to be carried and temperature control is therefore less critical. This meant there was no adverse effect on carrying capacity, and no cages were lost. Meanwhile, the trailer side skirts that cover half the wheels with the aim of reducing drag, were designed with a hinged mechanism which enables easy access to the underbody and wheels. 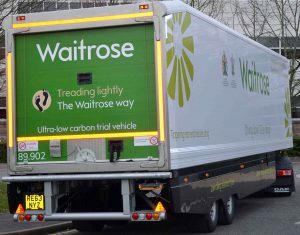 Waitrose commissioned its first handful of ultra low-carbon trailers in 2014. Built by Gray & Adams’ at it Fraserburgh headquarters, these were followed by more orders in 2015 and again in 2016. “We’ve fine-tuned the specification along the way but the basic concept has been a success since day one,” confirmed Simon Gray. “The trailers are delivering the 7% improvement in fuel efficiency that we’d anticipated, and this is over our standard trailers which are themselves of a low drag design. Waitrose has also ordered a number of specialised twin-deck trailers from Gray & Adams this year. “We’re never satisfied at the John Lewis Partnership and are always looking at ways in which we can do things better,” Gray said.